Millions of Egyptians have voted in a referendum on constitutional reforms, a month after a popular uprising swept President Hosni Mubarak from power. If passed, it would allow Egypt to hold fresh elections within six months. Initial results are expected on Sunday. A BBC correspondent in Cairo says that for most Egyptians, this was the first genuinely free vote in their lives. The referendum was marred by an attack on the Nobel Peace Prize winner and opposition figure, Mohamed ElBaradei. A crowd of angry youths pushed and threw rocks at the former head of the International Atomic Energy Agency as he tried to vote in Cairo. "I went to vote with my family and I was attacked by organised thugs," Mr ElBaradei wrote on Twitter. "Top figures of Mubarak's regime still at large and undermining the revolution." Mr ElBaradei was unable to vote at the polling station and eventually cast his ballot elsewhere, the Reuters news agency reported. At most polling stations, however, the atmosphere was cheerful. 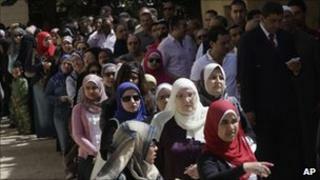 More than 2,000 people are standing in an orderly line waiting to vote in the well-off neighbourhood of Zamalek. It is taking up to three hours to get to the front of the queue and it is a hot day, but still, spirits are high. "I am so excited," says Nermeen Badayr, 53. "Last night I prepared my clothes like a child going to school on the first day. This is the first time I have ever voted in Egypt. I didn't care who was winning and losing in elections before as it was all pre-prepared." "I feel that I have a voice and I am free. I am so proud," says Asmaa Abbas, 23. She smiles with satisfaction as she shows off her finger dipped in mauve ink to prove she has cast her ballot. Volunteers help the elderly into the polling station at a government school and there are many spontaneous signs of camaraderie. When an old, working-class man in a long galabiya robe is spotted looking confused, a smartly-dressed young woman leaps forward to explain how to fill in his voting paper and hands him a silver pen from her designer handbag. The BBC's Jonathan Head in Cairo says the referendum produced something most Egyptians had never seen before - people queuing patiently for hours in lines that ran around the block to cast their ballots. Under former President Mubarak, elections were stage-managed affairs with pre-determined results and turn out was very low, our correspondent says. For many people it was the first time they had ever voted, he adds. If approved, the constitutional changes would pave the way for Egypt to hold new presidential and parliamentary elections within six months. The country's two main political groups, Mr Mubarak's National Democratic Party and the Muslim Brotherhood, backed the proposals. But pro-democracy activists said the changes did not go far enough and wanted the plan rejected. They said the constitution needed to be entirely rewritten before elections could be held. Mr ElBaradei, who emerged as an opposition figurehead during the uprising, said the referendum dealt only with "minutiae". "It doesn't talk about the imperial power of the president, it doesn't talk about the distortion of the parliament, it doesn't talk about the need to have an independent constituent assembly that represents everybody." "So we are going to say no. Most of the people who triggered the revolution are going to say no." The scholars who drafted the changes did not radically overhaul presidential powers because they said the next parliament should rewrite entirely the constitution. Analysts say the NDP and Muslim Brotherhood stand to benefit from early elections because dozens of smaller parties set up following the uprising have yet to fully organise themselves. Mr Mubarak stood down in February after 18 days of popular protests, largely centred on Cairo's Tahrir Square. Crowds of activists once again crammed Tahrir Square on Friday, this time to protest against the referendum.